We live in an apartment - our's is 1 of 4 in its separate complex and then behind us is 4 blocks of apartments which are 3 storey's high, overlooking the canal. In one of those apartments is an old lady who lives by herself. Luke and I have always spoken to her when we've seen her in the car park or around town, and along the canal walk. She is lovely, and her name is Joyce. As soon as we had Jake and we took him out, if we saw her she would always stop to see him and comment on how lovely she thought he was. She even have him his first £2 coin for his savings box! Last week she caught me on my way to work, and the first day of dropping Jake off at nursery. Needless to say, I was a little emotional and she was very kind. Today, as I was leaving to take Jake to nursery (which he loved by the way!) I ran into Joyce outside our complex - she was just about to ring our buzzer! She said she was pleased she'd caught me as she had something for Jake, and she pulled out this M&S bag. 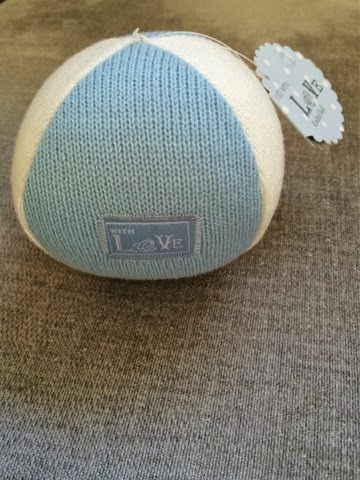 Inside was this lovely ball! It was so kind and thoughtful of her! She told me not to worry myself as she had bought it in the sale for him and it hadn't cost her much, but she seemed so happy to have done this for him. She had a little chat with him in his car seat and then went on her way. I was so touched by her kindness. What a lovely thing to do! I felt that I had to do something in return, and so, I have had a little thank you card done with a photo of Jake on and sent it to her in the post as a nice surprise in the next few days. The kindness of strangers can be so surprising; it really made my day, and Jake has played with the ball this afternoon. Has anyone ever done something like this for you? Or you for someone else? Oh how lovely, what a nice thing to do. One of my mum's friends used to knit cardigans for my little girls even though she never met them and I was always very touched by her kindness. Isn't it lovely when little things like that happen?